I've never been a girl who loves Halloween. But I'm totally infatuated with autumn: crisp walks, brilliant blue skies here in Colorado, the smell of decaying leaves and cooling dirt as the dogs stir up the undergrowth with their paws. I love the way Nature gets down to the bare bones of things. Tree branches, liminal against the distant mountains. The last roses dwindling to hips and swelling against the coming cold. And one of the best things about the shift in season is the change in cravings and the way I think about food. The way I browse through grocery stores and plan menus. I eat simply in summer--everything fresh, light, often cold or raw. White or rose, instead of red wine. But when the temperatures drop, I suddenly want comfort. For me, that takes the form of roasted cauliflower with parmesan and thyme; chicken curry; butternut squash soup with bacon and kale; beef ragout and pappardelle. 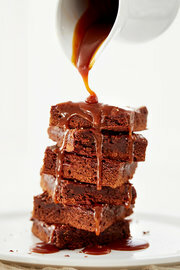 Or the salted caramel brownies pictured above. This is not my recipe. It's Julia Moskin's from the New York Times Cooking section, which is one go-to source of inspiration in any season of the year. These brownies take time. They involve careful attention, because homemade caramel is a challenge if you've never done it before, but the result is so hands-down enslaving you'll never bother with another brownie recipe again. I made them to bring to my book group this evening, but I ate one for breakfast. They'd be a great substitute for dinner, too, with a glass of bourbon or tawny port by the fire. All of which is not to say that I turn out the lights and draw the shades when the Trick-or-Treaters stop by. 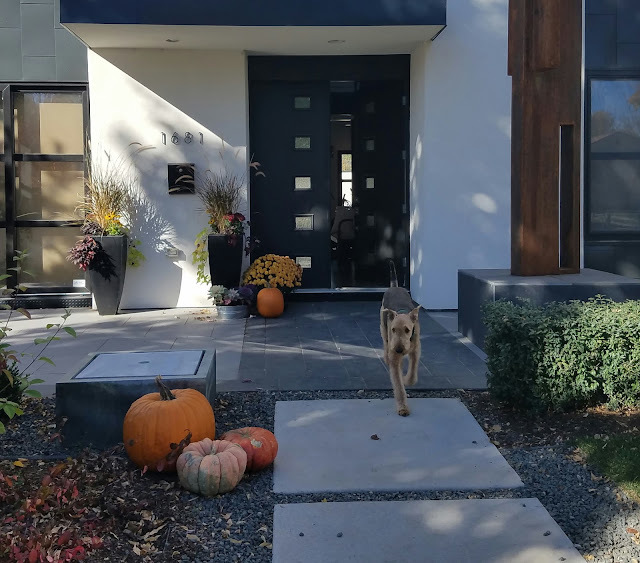 I skip the fake witches and trailing spider webs and plastic gravestones on the front lawn (staples of our Denver neighborhood), but I set out some fall color in the form of pumpkins and flowers, another grown-up treat. 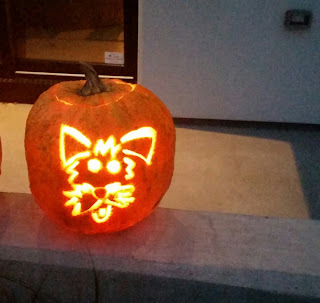 I have a thing about carving pumpkins, too. If you're going to go to all the trouble of scooping out those slimy seeds, why not have some fun with it? Over the years I've saved pictures of my favorites. There was the mummy. The cat arching against the moon. The witch flying into the stormy sky. And of course, the Scary Airedale. I downloaded a template for that one from the internet. I'm sure your pet is out there somewhere, too, waiting to be immortalized in a hollow burning gourd. What's your grown-up treat for autumn? Have a wonderful fall, everyone! Francine, you've made me so homesick for Virginia! It's currently 90 degrees (at 1:20 pm) here in Arizona. The crisp air and crimson leaves are but memories... As for my favorite fall treat, absolutely nothing tops homemade apple pie! Oh, Francine, your wonderful descriptions show exactly why you are such a great writer. We often hear in workshops that authors should try to use our different senses so the reader can better appreciate a scene or the "feelings" of the characters -- and you've used several of them in your very nice post: "seeing" the cleverly carved pumpkin, "tasting" those caramel brownies, "touching" the slimy pumpkin seeds, and all the rest. Thanks for reminding us of the joys of the Fall season!